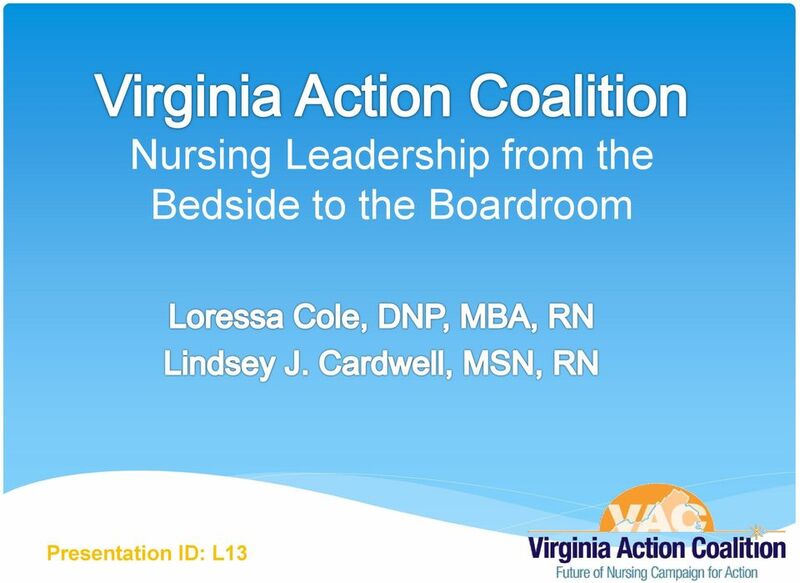 Download "Nursing Leadership from the Bedside to the Boardroom. Presentation ID: L13"
2 Disclosure Today s presenters do not have any relevant financial interests presenting a conflict of interest to disclose. Participants must attend the entire session(s) in order to earn contact hour credit. 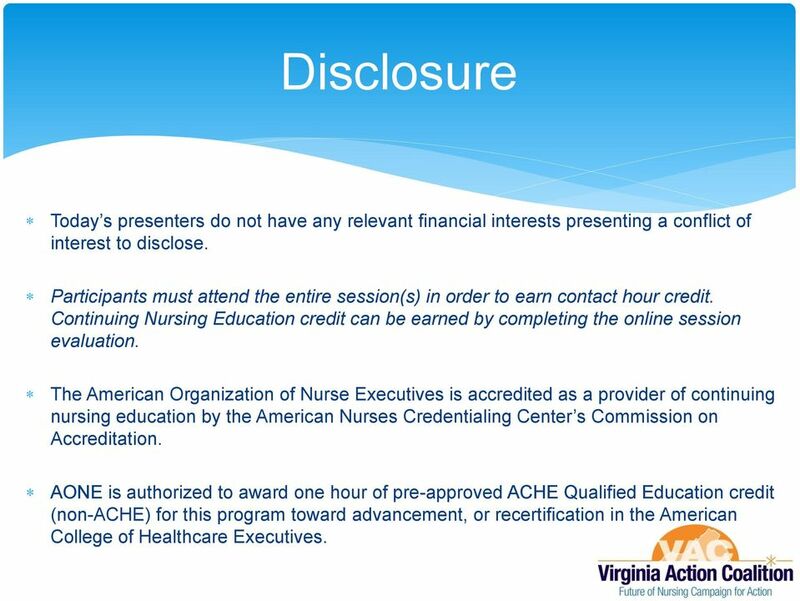 Continuing Nursing Education credit can be earned by completing the online session evaluation. The American Organization of Nurse Executives is accredited as a provider of continuing nursing education by the American Nurses Credentialing Center s Commission on Accreditation. AONE is authorized to award one hour of pre-approved ACHE Qualified Education credit (non-ache) for this program toward advancement, or recertification in the American College of Healthcare Executives. 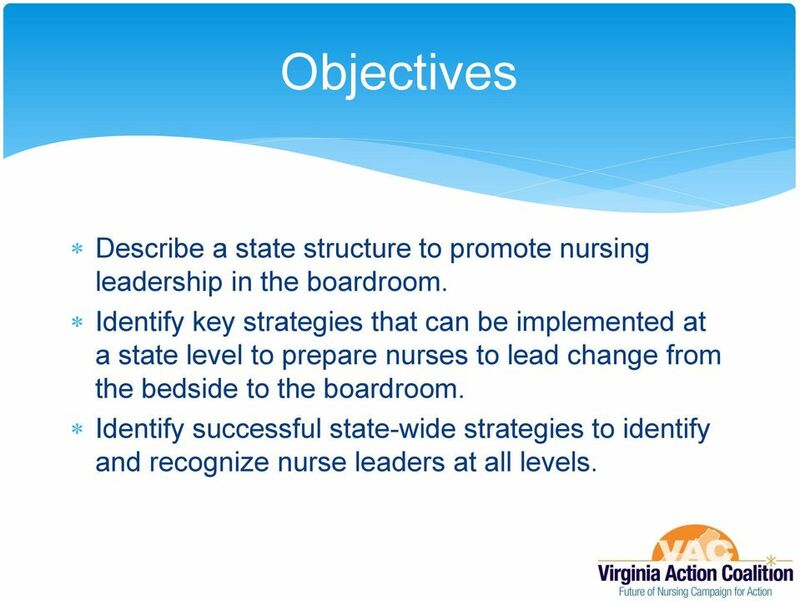 3 Objectives Describe a state structure to promote nursing leadership in the boardroom. Identify key strategies that can be implemented at a state level to prepare nurses to lead change from the bedside to the boardroom. 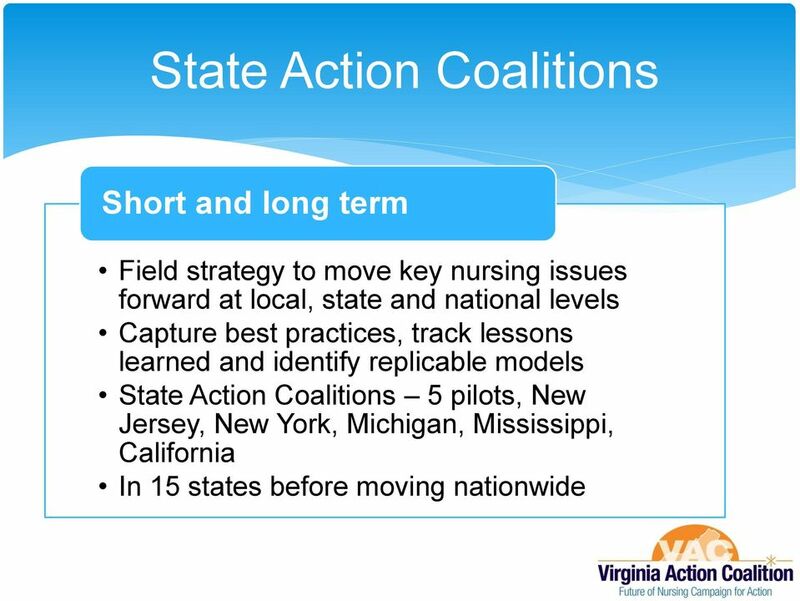 Identify successful state-wide strategies to identify and recognize nurse leaders at all levels. 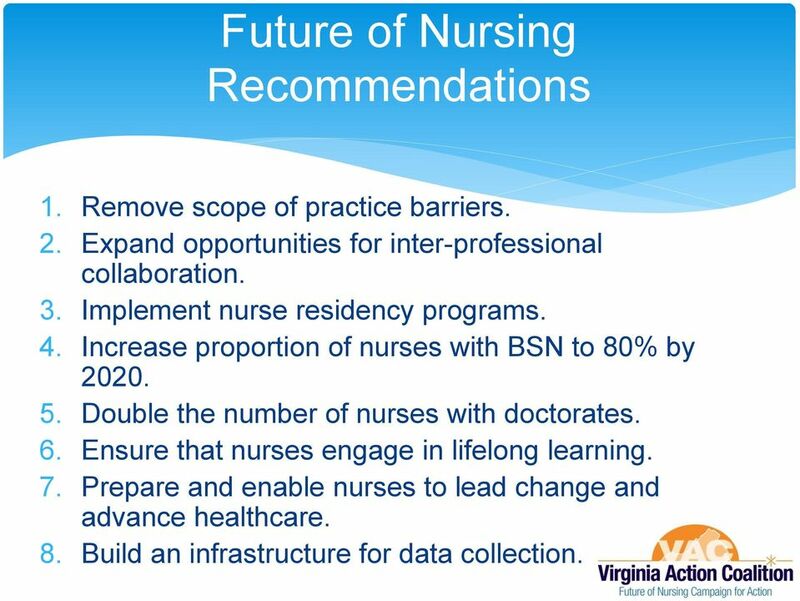 9 Future of Nursing Recommendations 1. Remove scope of practice barriers. 2. Expand opportunities for inter-professional collaboration. 3. Implement nurse residency programs. 4. Increase proportion of nurses with BSN to 80% by Double the number of nurses with doctorates. 6. Ensure that nurses engage in lifelong learning. 7. 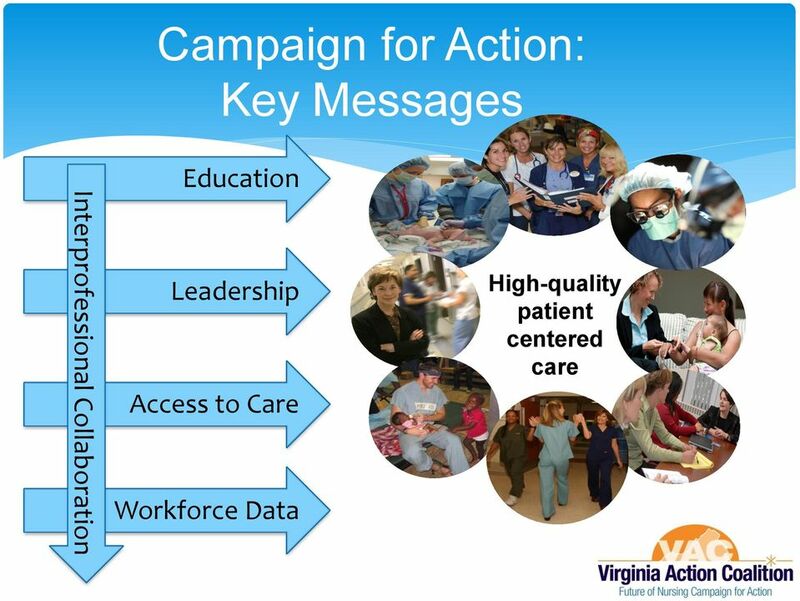 Prepare and enable nurses to lead change and advance healthcare. 8. Build an infrastructure for data collection. 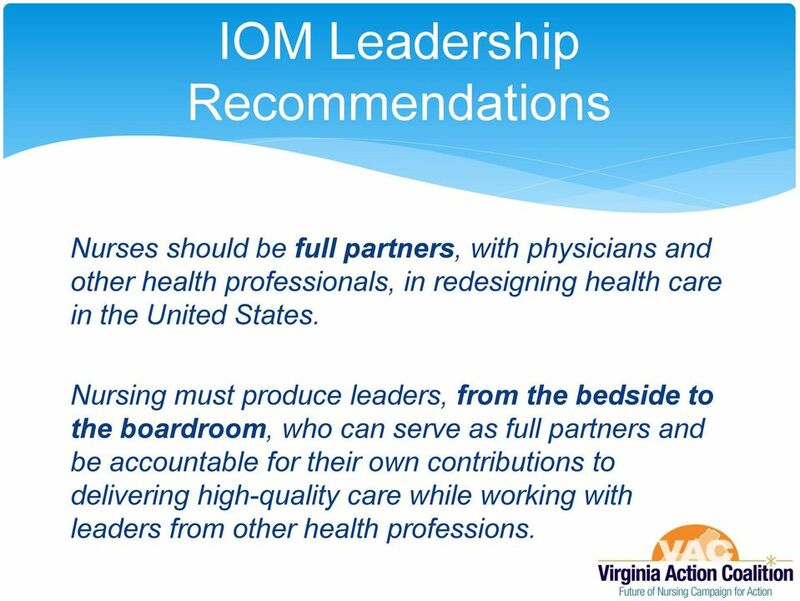 17 IOM Leadership Recommendations Nurses should be full partners, with physicians and other health professionals, in redesigning health care in the United States. Nursing must produce leaders, from the bedside to the boardroom, who can serve as full partners and be accountable for their own contributions to delivering high-quality care while working with leaders from other health professions. 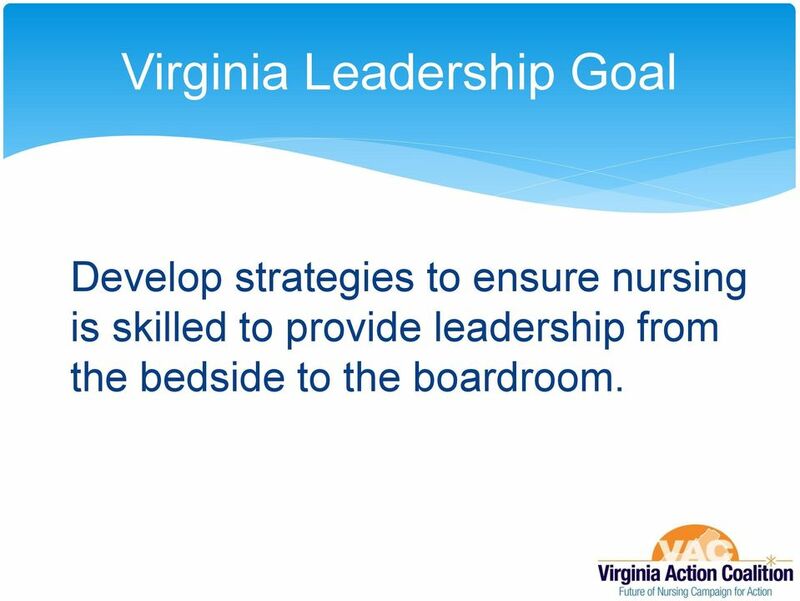 18 Virginia Leadership Goal Develop strategies to ensure nursing is skilled to provide leadership from the bedside to the boardroom. 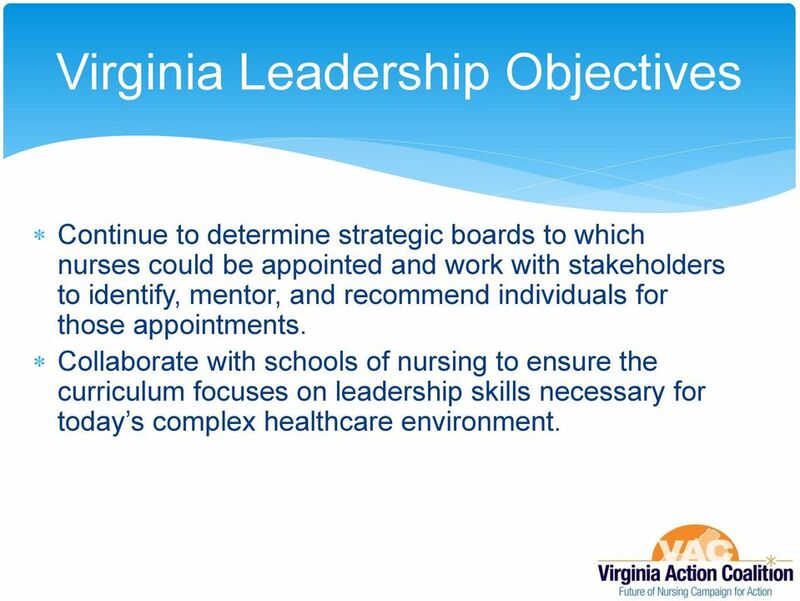 19 Virginia Leadership Objectives Continue to determine strategic boards to which nurses could be appointed and work with stakeholders to identify, mentor, and recommend individuals for those appointments. Collaborate with schools of nursing to ensure the curriculum focuses on leadership skills necessary for today s complex healthcare environment. 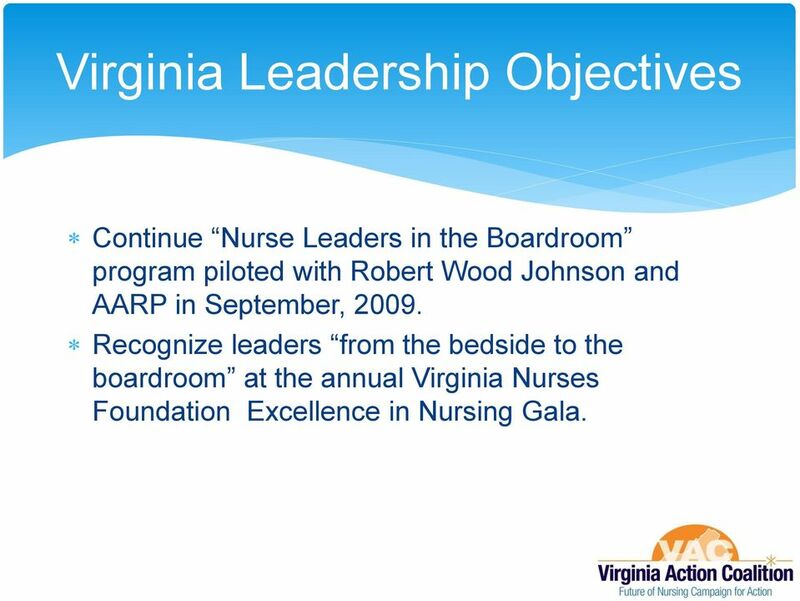 20 Virginia Leadership Objectives Continue Nurse Leaders in the Boardroom program piloted with Robert Wood Johnson and AARP in September, Recognize leaders from the bedside to the boardroom at the annual Virginia Nurses Foundation Excellence in Nursing Gala. 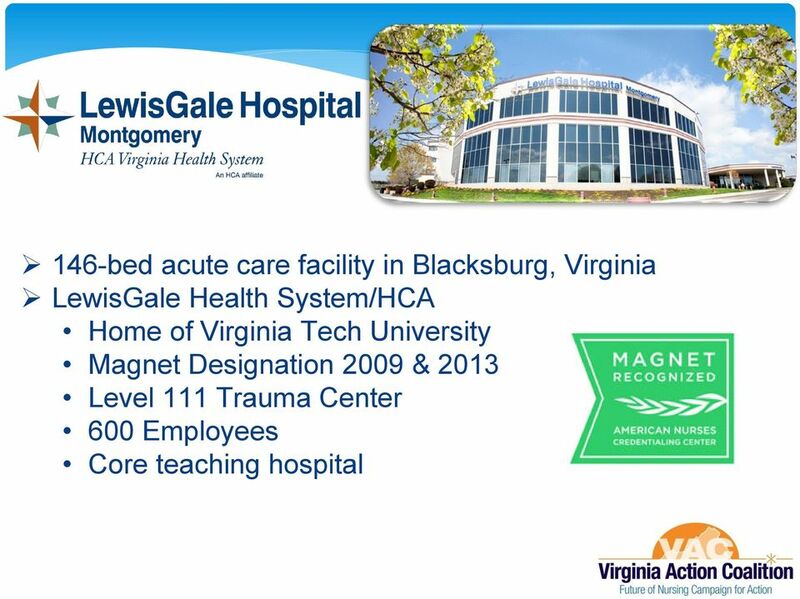 21 Virginia Leadership Objectives Continue to support the current and expanded Nurse Leadership Institute (NLI) by participating on committees, providing scholarships, assisting in encouraging employers to nominate fellows and nurses to serve as faculty. 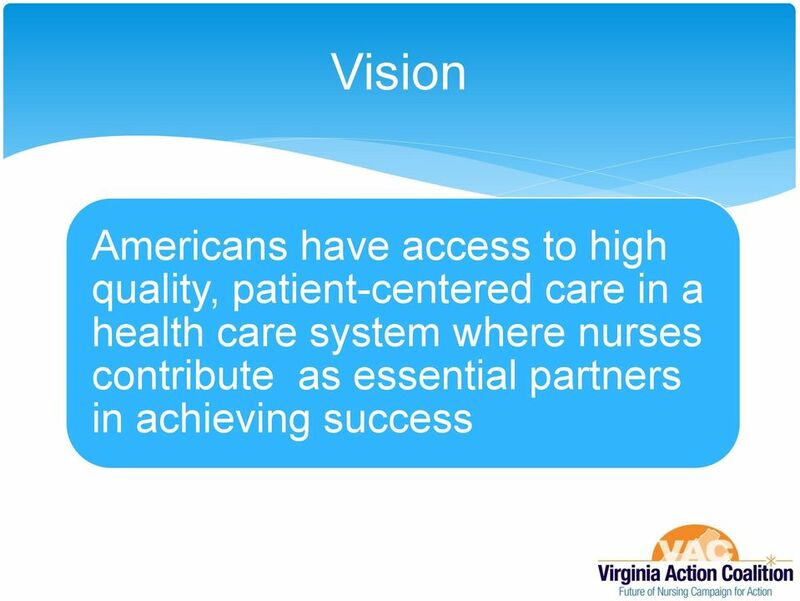 NLI, a program of the Richmond Memorial Health Foundation and a 2007 Partners Investing in Nursing s Future (PIN) grantee, is a nine-month leadership development course for nurse leaders working in all sectors of healthcare across the Commonwealth. 24 Do you currently serve on a local board or organization s board of directors? 25 What type of local board are you serving on? 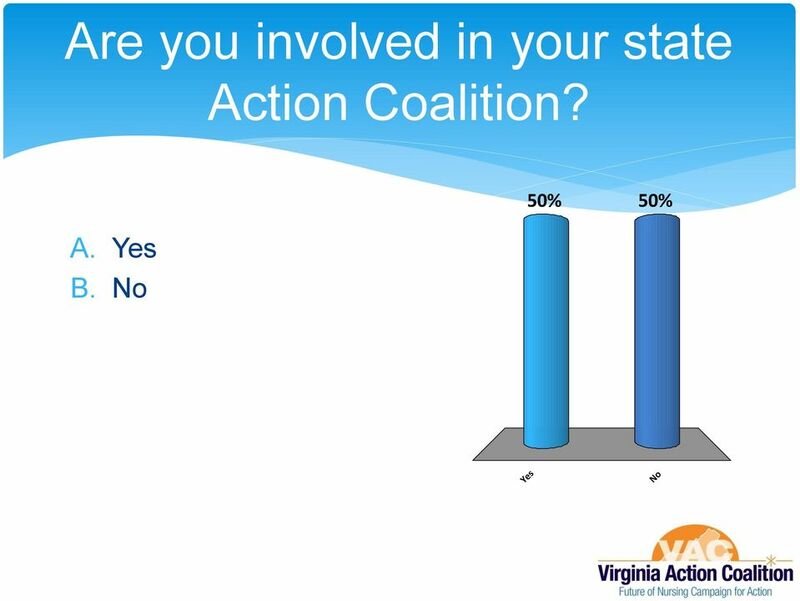 28 Do you currently serve on a statewide board or organization s board of directors? 29 What type of state board are you serving on? 32 Do you currently serve on a national board or organization s board of directors? 33 What type of national board are you serving on? 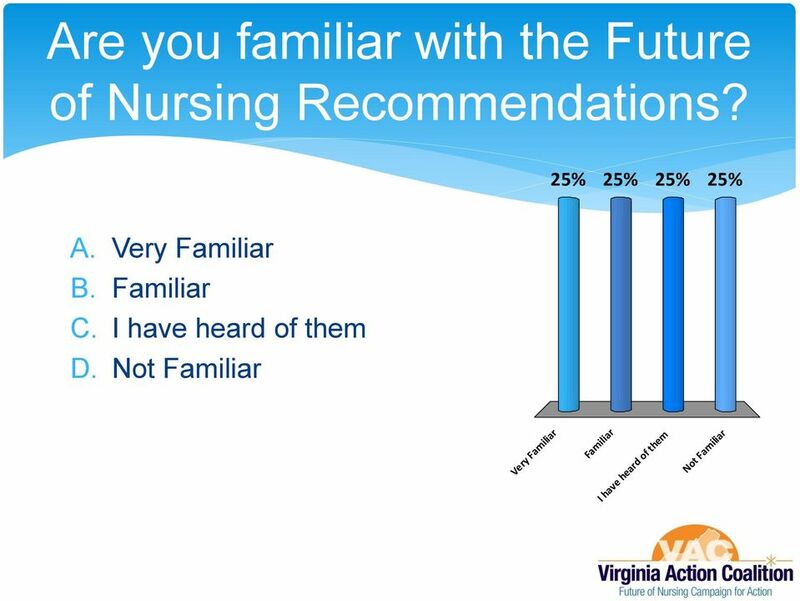 35 Future Nurse Board Leaders Of the Registered Nurses surveyed, 60.3% of those not currently serving on a board, were interested in future board leadership. 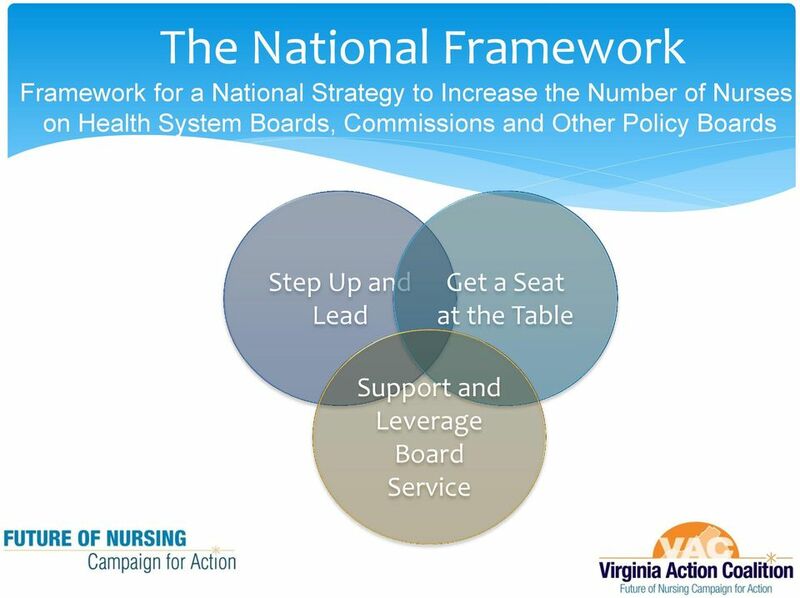 181 Virginia Registered Nurses are future board leaders! 36 Experienced Nursing Board Leaders Willing to Mentor New Board Members 64.1% or 118 Experienced Nurse Board Leaders were willing to mentor other Registered Nurses interested in board leadership. 37 Board Appointments Virginia Nurses Association submitted resumes of qualified nurses for state gubernatorial appointments. Nurses from survey interested in board service. VNA advertisement for interested candidates. 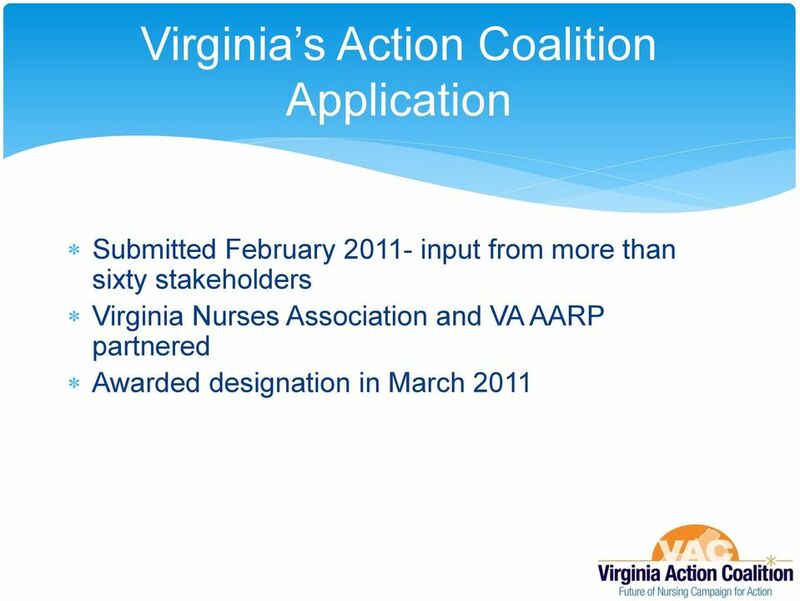 Appointments made by the Governor from the candidates recommended by the Virginia Nurses Association. One successful recommendation for a hospital board. 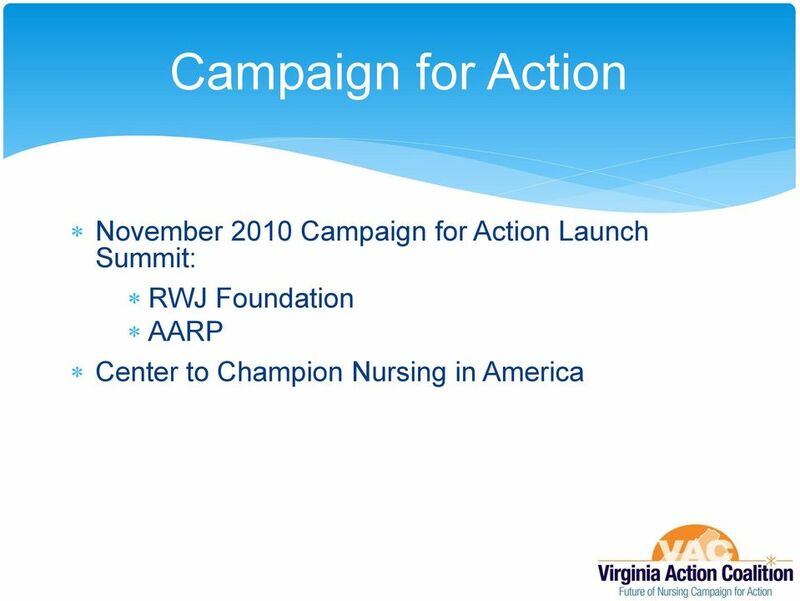 39 Mentorship Structure Nurses may submit name and resume to database if interested in serving and be connected by action coalition. Mentor of new nurse board leaders. Mentee of experienced nurse board leaders. Future goal to provide a match.com type database and allow individuals to select their own mentor or mentee. 40 Nursing Leadership on Hospital Boards Gallup ranks nurses as most ethical and honest. Opinion leaders say nurses should have more influence on health systems and services. Nursing currently ranked sixth behind other stakeholders to influence health reform. Top barrier to nurses influence and leadership is not being perceived as important decision makers. Less than 6% of hospital board members are nurses. 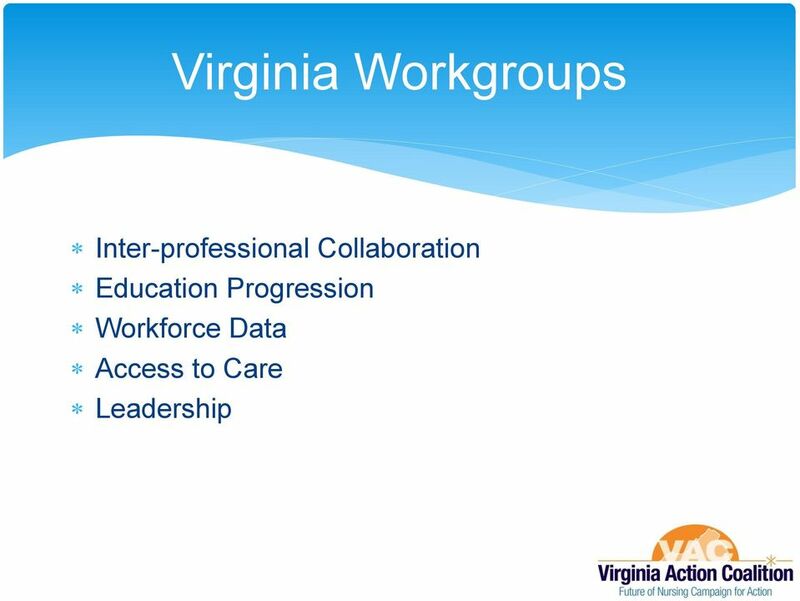 44 Nursing Leadership on Hospital Boards Next Steps: Collaborate with the Virginia Hospital Association to assess the number of nurses serving on hospital boards in Virginia. Identify barriers to nursing service on hospital boards. Develop relationships and strategies to promote nursing leadership on hospital boards. 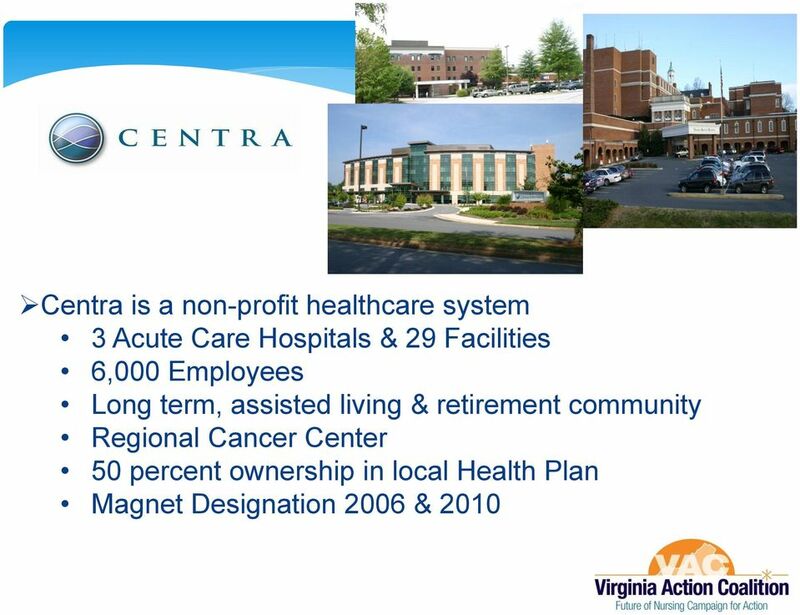 46 Recognizing Nursing Leadership 40 Future Nursing Leaders Under 40 recognized at the annual Virginia Nurses Foundation Gala in 2012. 50 References Hasmiller, S. Combes, J. (2012). Nurse leaders in the boardroom: A fitting choice. Journal of Healthcare Management, 57 (1), Institute of Medicine. (2011). 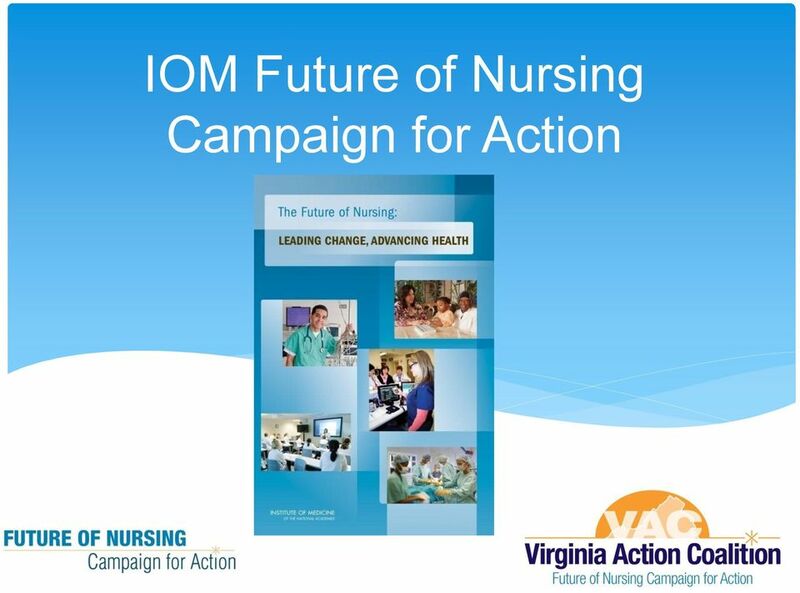 The future of nursing: leading change, advancing health. Washington, DC: The National Academies Press. Who should we address the letters of support to? You may address the Letters of Support to To Whom it May Concern. Regina Grazel, MSN RN BC APN-C Primary Work Function/Position: CNS, NJ Department of Health CCHD Screening Program Education: UNIVERSITY OF PENNSYLVANIA, Philadelphia, Pennsylvania. MSN in Perinatal Nursing.